The world is becoming very well-aware of traffic issues. There are hundreds of different aspects that come with transport. There is an environmental effect which is leading to pollution, then there is an issue with traffic congestion, and also, the world is becoming fast-paced. Although traffic is supposedly a solution for people who want to reach destinations quicker, heavy traffic is making things worse. The folding electric bicycle offered by URB-E is an actual solution to such issues. How is that? Keep reading to find out. Compact size The URB-E folding electric bicycle is a small sized scooter that offers mobile transportation. It is designed intelligently to provide a large number of facilities in a compact size. The compact size of the URB-E makes it not just travel-friendly in terms of carrying it around, it also makes it time efficient. This means, with the URB-E, you don’t have to worry about traffic jams. This way, the clutter that is formed on roads with traffic blocks is eliminated. However, the small size doesn’t compromise the sturdiness of the URB-E. Size contributes to the factor of mobile transportation majorly. Environment-friendly The clutter that is forming in the atmosphere is something we don’t really consider because we cannot really see it with the naked eye. However, the damage is beyond control. From noise pollution to air pollution, regular transport is turning the world into an unsafe and unhealthy place to live in. However, the folding electric bicycle solves this problem as well. User-friendly The mobility of the URB-E is improved with its unique technology. Things like a charging connection for any device make it extremely user-friendly and add to the convenience of mobility. Users can get a lot of different kinds of advantages out of this form of mobile transportation. URB-E manufacturers believe in mobility that is making life easier on the whole. Other than being able to easily skim through the congested roads, URB-E provides the convenience of fully charged devices on the go. 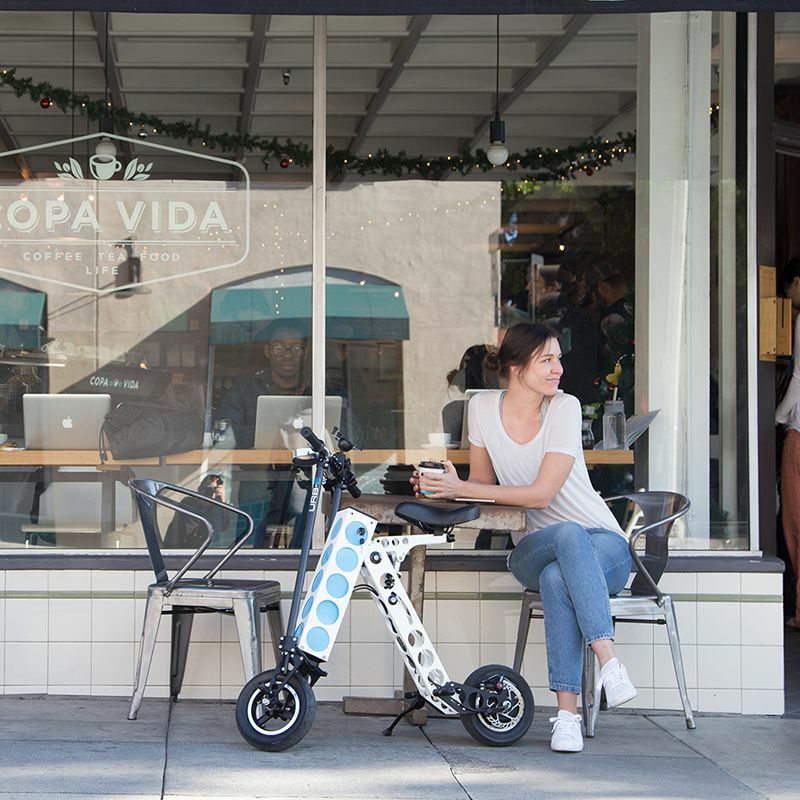 Here are some happy customer reviews to help you become confidently choose URB-E over any other form of transportation Cost-friendly Along with being super cool, the URB-E is a low-cost product that also saves you money on a daily basis. You can get the service of easy mobility in only $899! After the purchase, the folding electric bicycle minimizes the cost of maintenance and travel. Since it is electrically charged, you don’t have to worry about gas refills. Similarly, the cost of parking for the URB-E is also very minimal. Along with that, the smart vehicle takes very little parking space. This will reduce the parking congestion as well as leave a wider space available for vehicles to move around on the road. The URB-E is an intelligent vehicle that is adopting smart techniques to solve the issues of clutter on road and in the environment. It has taken mobility convenience to a new level. The URB-E is an impressively remarkable technology.